The Border Police of Bosnia and Herzegovina (BiH BP) presented in Sarajevo the brochure named “Protected Documents Handbook”, developed with the support of the OSCE Mission to BiH. The purpose of the Handbook, as it was announced from OSCE Mission, is to enhance the professional ability of the BiH Border Police officers to detect new document forging techniques and improve their knowledge of the latest document protection technologies. The Handbook is part of the Border Police’s efforts to stay abreast of the continuous introduction of ever more sophisticated physical, optical and electronic document protection techniques in this field and to raise awareness of the adaptability of criminals to the new technologies. “The abuse of identification documents presents a transnational threat to security, as it can be used for committing crimes, including those related to illegal migration, human trafficking and smuggling. Since forged travel documents are most frequently used during state border crossing, their detection is a key element of border control and a prerequisite for its efficiency,” said Sanja Fitzgerald, Project Officer in the Security Co-operation Unit of the OSCE Mission to Bosnia and Herzegovina. Emir Kulaglić, a police officer with the BiH Border Police, who is one of the authors, said that the Handbook provides explanations, illustrated with photographs, of the methods of designing protected documents, including all printing techniques, both conventional and digital, as well as protective features. “Special attention is paid to the ways in which protected documents may be forged and how to verify whether they are genuine or not. It also explicates the latest trends in forgery, such as Morphing, which is not widely known, but is increasingly used in the course of illegal migrations”, Kulagić explained. 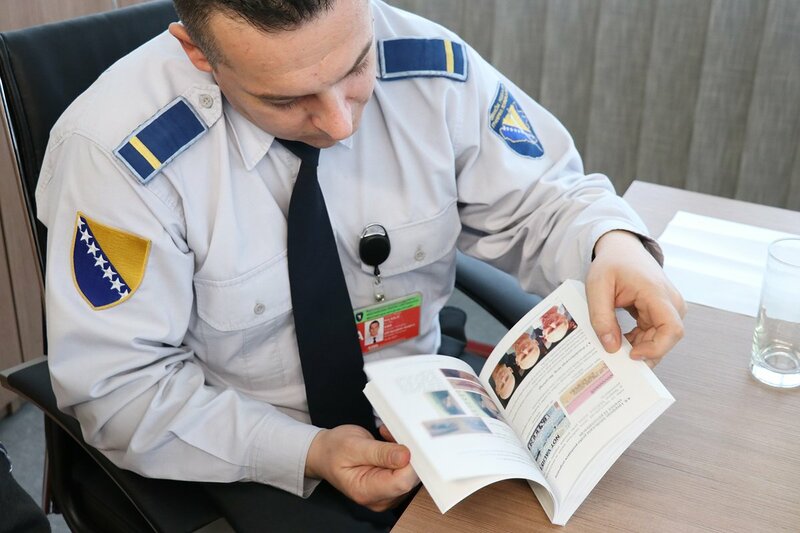 He added that the Handbook will be available to BiH Border Police officers at all border crossing points, both in print and in electronic version form, in order for the officers to learn about its content, increase their knowledge and use it during their performance of everyday document control tasks.